Technology has reduced the labour required for mass production and is further hollowing out the job market by automating even routine legal and accounting tasks. Robotics is making a major breakthrough in manufacturing, with 200,000 industrial robots coming into use each year and a total of 1.5 million expected by this year (2015). For developed and developing nations alike, it is clear that as globalization gathers pace, adding more supply chains operating in more complex regulatory environments with blurred geographic boundaries, no country can ignore the digital world without getting left out of the world economy. So how can we keep the human dimension — in a world of work run more and more by robots? How can we best adapt the labour market and create decent jobs? Fundamentally and critically, we need to anticipate upcoming technological changes and tackle the education and skills mismatch in labour markets. Globally, one third of employers surveyed complain of not being able to find the right skill sets to fill existing vacancies. We must build solid bridges between the world of work and training providers, so that skills can be matched to market needs. This is not only a matter for public policy. Employers and trade unions must take more responsibility for investing in skills by sitting at the table with trainers and policy makers. Their talks must be informed by labour market information, employment services and performance reviews. Adequate education and skills for countries at all development levels increases their ability to innovate and adopt new technologies. 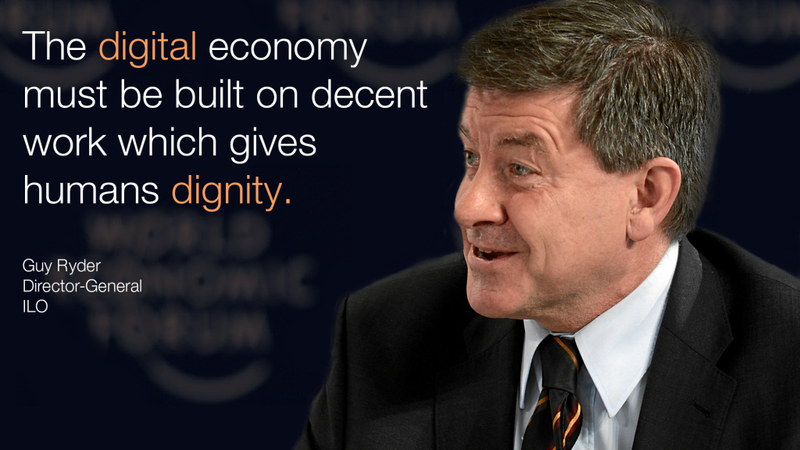 It means the difference between inclusive growth and growth that leaves large segments of society behind. A workforce that has been appropriately trained and is able to continue learning boosts investor confidence and thus job growth. Changes are inherent in the very nature of the relationship we have with an employer. Workers entering the job market are increasingly offered short-term or temporary contracts and are often forced to take informal work or emigrate for a job. This is exacerbating trends towards income inequalities. Beyond training for workers in the digital era, sustainable economies require protections for workers in good times and bad. Along with adequate unemployment benefit systems, social protections such as healthcare and pensions form a basis for overall worker security and a healthy economy. Yet only 20% of the world’s population today has adequate social security coverage and more than half lack any coverage at all. It has been proven that social protection can work as a buffer to mitigate the effects of economic crises. The ILO also advocates minimum levels of social protection as spelled out in its Recommendation 202 concerning national floors of social protection. Established “pre-digital world” values, which are encoded in ILO labour standards, still apply in our post-digital era. In fact, they become even more relevant if the traditional employee-employer relationship becomes increasingly eroded in the future. The evolving complexities of the world of work will require complex solutions. This is why last year I launched the ILO’s “world of work” initiative to try and provide a factual understanding for defining the trends ahead and discussing what needs to be done to establish the post-digital world we all want. Our world has changed vastly over the past century and not only because of technology. By 2050, the global population will surpass 9 billion. The number of people aged 60 years and over will have tripled. Three-quarters of older persons will be living in what are now developing countries and the majority will be women. This new demographic context has profound implications for labour markets, social security systems, employment and economic development. For all the strides we’ve made since the Luddite era, we arrive back at the simple truth that the machines were and continue to be built by human brain and brawn. Now and going forward, the digital economy must be a sustainable one and it must be built on decent work which gives humans dignity. It is work which is productive and delivers a fair income, security in the workplace and social protection for men and women and their families. Guy Ryder is attending the Annual Meeting 2015 in Davos, and is a panel member in the session Employment: Mind the Gap on 23/1 at 12.30 CET. This entry was posted in ILO posts, Posts by the Director-General and tagged artificial intelligence, Davos, digital economy, employment, Future of Work, Job Skills, Robotics, Technology, World Economic Forum by ILO Blog. Bookmark the permalink. Reblogged this on Transitions At Work.